On April 10, Sesame Street will premiere its newest Muppet, Julia. Julia is a 4-year-old with autism. 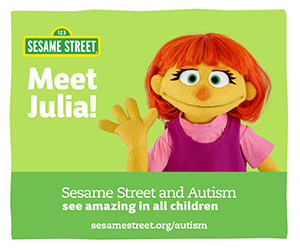 Julia’s arrival to Sesame Street is part of an ongoing initiative to raise awareness and understanding of autism, which originally launched in the fall of 2015. The initiative, called Sesame Street and Autism: See Amazing in All Children, was created following calls from advocates to help bring visibility to the families and caregivers of children with autism. “For years, families of children with autism have asked us to address the issue. We heard a call to use our expertise and characters to build a bridge between the autism and neurotypical communities,” said Dr. Jeanette Betancourt, senior vice-president of U.S. Social Impact, Sesame Workshop. Julia may be familiar to some – she first made friends with Elmo and Abby in a digital form through the online storybook We Are Amazing, 1,2,3!, written by Leslie Kimmelman, whose son has autism. The story teaches children the different ways that the friends play, interact, and are amazing. A print version of the book is planned for January of 2018. To create the See Amazing initiative, the Sesame Workshop spent five years learning more about the condition that affects one in 68 children in America. Find resources about autism and See Amazing below, and don’t miss Julia’s first day on Sesame Street on April 10 on CPTV!